There are many options available for shuttle buses from the Airport (Tullamarine) to the Australian Synchrotron, some that run only during business hours and others that run 24/7. Please see the list below for some potential options. As an alternative to commuting by public transport, there are taxis readily available for use to destinations all around Melbourne. Important: The Australian Synchrotron does not provide users with cabcharge vouchers for travel. If you are travelling from interstate or New Zealand, please retain all receipts and present them to your host organisation. The main roads leading to Melbourne's city centre are the Hume Highway from the north (Albury Wodonga, Yass and Sydney), Western Highway from the west (Adelaide), Princes Highway from the east (Gippsland), and Princes Highway from the south-west (Geelong). CityLink is Melbourne’s toll road system that encompasses the Tullamarine Freeway, the Monash Freeway and the EastLink Freeway. Visitors often use these roads without realizing that a toll must be paid. Tolls can be paid over the phone or over the internet on the site below. You can purchase a day pass while driving by calling 13 26 29. All parking is free of charge. 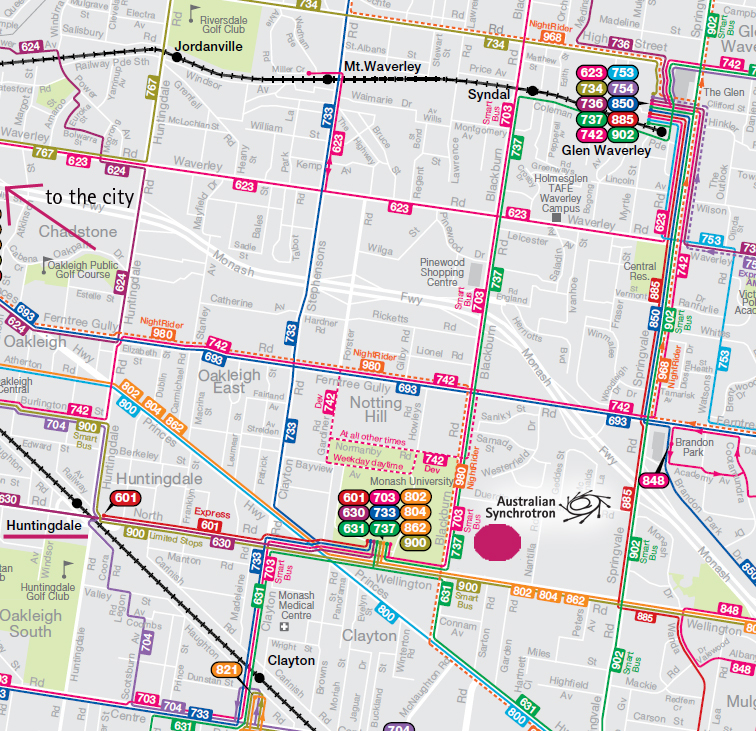 You will need to purchase a Myki card if you intend to travel on any Melbourne metro bus, train or tram. The Australian Synchrotron has two pool vehicles on site. Please see the User Office if you would like to borrow a car. Pool vehicles are only available to User's participating in beamtime at the Australian Synchrotron.